Nolan's supreme confidence, narrative skill, and taste for complexity make for unusually rich popular entertainment. Where was The Prestige this summer when we needed it most? 128 min. Touchstone Pictures. Director: Christopher Nolan. Cast: Hugh Jackman, Christian Bale, Michael Caine, David Bowie, Scarlett Johansson. The best magicians ever to prowl a stage have understood keenly what their audiences have willfully ignored: that magic, in its most transcendently prestigious—and beautifully fleeting—moments, thrives on the wishful thinking that the impossible just could be possible. In no literal sense have those great artists believed in magic, but all the same they devoted their lives to transcendent moments: the emotional alchemy of a transfixed audience. By demonstrating its own total, exquisite commitment to craft, Christopher Nolan's The Prestige celebrates great escapism. Demanding audience attention with its signature line—"Are you watching closely? "—The Prestige is a puzzle film, ornately designed in the fashion of a magic trick. According to seasoned ingeneur Cutter, "every great magic trick consists of three acts": The Pledge of something purportedly ordinary, The Turn to the extraordinary, and the shocking culminative flourish dubbed The Prestige. This is the gospel of the highly competitive Victorian-era illusionists at deadly serious play in The Prestige: Robert Angier (Hugh Jackman) and Alfred Borden (Christian Bale). For reasons including but not limited to professional pride, Angier and Borden find themselves locked in a mortal combat of dangerously escalating oneupmanship. In adapating Christopher Priest's novel, Nolan and co-screenwriter Jonathan Nolan swiftly establish magic as a metaphor for filmmaking, justifying their extravagances even as they present them. Borden argues passionately for something "fresh" in a stagnating magic world. Such a pursuit demands obsessive self-sacrifice, and though it does not promise anything to its practitioner, it tantalizes with the same possibility the magician will commodify for his audience. "Total devotion to his art," Borden says of another illusionist. "It's the only way to escape all this." With a knock at the brick of a London alley, he sums up the disappointment of the physical reality beyond which every character in the film wants to get, preferably not by dying. "Man's reach exceeds his imagination," says one wag, while Nikola Tesla (played by—hold on to your top hat—David Bowie) remarks, "Man's grasp exceeds his nerve." If excess is a given in the world of The Prestige, the Nolan brothers accomodate with a convoluted plot that hinges on a preposterously fanciful point. With the audience squinting to suss out the misdirection, Nolan and his co-screenwriter brother Jonathan work up a sweat cramming in enough various characters (like Scarlett Johansson's pretty assistant) and feints (Tesla's brow-knitting experimentation) to keep the audience very busy indeed. Even as they skip forward and backward in the narrative, the Nolans take advantage of film's temporal forward momentum: for the audience, there'll be no flipping back of pages to ponder clues. Viewer's minds will recklessly travel down various possible avenues for the plot before the complete shapes of the characters' secretive endgames become clear. Ultimately, the earnestness of style cannot mask the plot's silly underpinnings, and as such, Nolan can't entirely pull off either his pulpy genre conceits or his ravishing melodrama—but it's a grand time watching him try. Nolan's supreme confidence, narrative skill, and taste for complexity make for unusually rich popular entertainment. 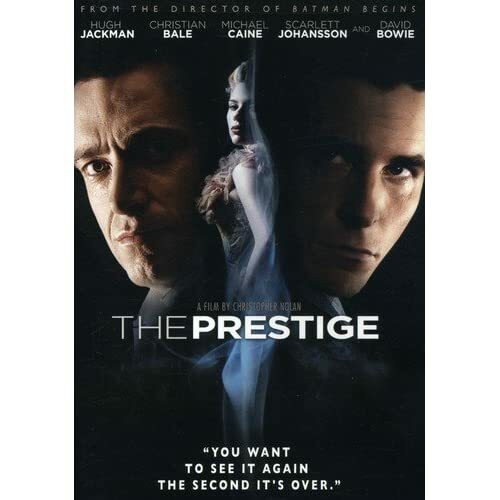 Where was The Prestige this summer when we needed it most? Buena Vista's special edition of The Prestige showcases a strong, spotless, film-like transfer of Nolan's visually intricate film, with a surround soundtrack to match. The keepcase includes an insert with a listing of chapter stops, and a classy menu design provides access to two bonus features. The first is a making-of featurette (19:30) organized into six short segments with a "Play All" feature. "The Director's Notebook" (3:46) sets the tone, with Nolan explaining the film's themes with B-roll footage interspersed. "Conjuring the Past" (5:10) focuses on production design, "The Visual Maze" (3:28) details Nolan's shooting strategy, and "Metaphors of Deception" (3:26) gets into the business of magic. The self-explanatory "Tesla: The Man Who Invented the Twentieth Century" (2:37) and final-word "Resonances" (1:03) round out the featurette, thoughtfully enhanced for widescreen TVs. In addition to Nolan and his brother Jonathan, actors Jackman, Bale, Caine, Johansson, Rebecca Hall and Piper Perabo participate, as do Priest, production designer Nathan Crowley, DP Wally Pfister, and costume designer Joan Bergin. Nolan's comments deepen the experience of the film, and the behind-the-scenes shots are tantalizing, but in a way, it's enough to make us wish Buena Vista had seen fit to produce more in the way of bonus features. What more we get is a gallery called "The Art of The Prestige," which is nice, but would be nicer with some captions (particularly for the crew portraits in the "Film" section). The gallery is divided into four sections: "Film" (26 shots), "Costume and Sets" (26 shots), "Behind the Scenes" (22 shots), and "Poster Art" (10 shots). Naturally, you'll also find previews for other Buena Vista titles. Given the film's quality and the inclusion of some welcome extras, The Prestige deserves a slot in home theaters. All site content © 2000-2019 Peter Canavese. Page generated at 04/25/2019 05:43:16PM.